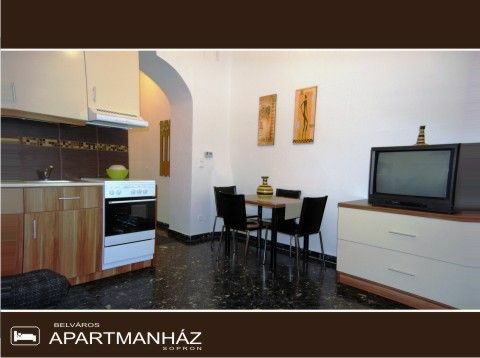 The apartment house is located directly in the downtown of Sopron, in an elegant street. The ideal starting point for excursions. Sopron offers: wine, medieval monuments, churches, culture and thermal baths in the neighbourhood (Balf, Bük, Sárvár), you can play golf, bike or sail on Lake Neusiedl. Enjoy that Austria is just one jump. Sopron is located only 60km far from Vienna, 15 km far from Eisenstadt.Only 1 hour on motorway to Austria's most modern ski resort Semmering Stuhleck or Hirschenkogel. • The hotel's own parking lot is available for the guests at 4 EUR per car per day. • Children under 2 stay free in their parents' room if no extra beds are required. • Pets are allowed for an extra charge of 6 EUR per day. • Rates exclude tourist tax (1.80 EUR per person per night).